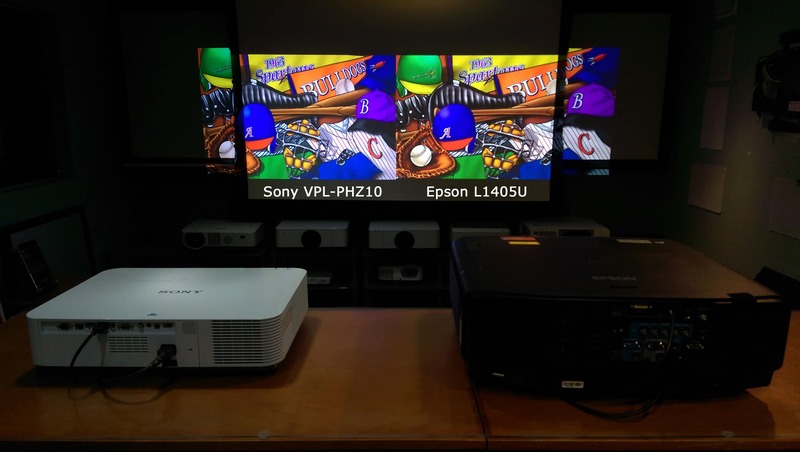 After we compared the Sony VPL-PHZ10 laser projector to some of the single chip DLP projectors, we also did some comparisons to Sony’s existing laser projectors and to Epson’s new line of Laser projectors. 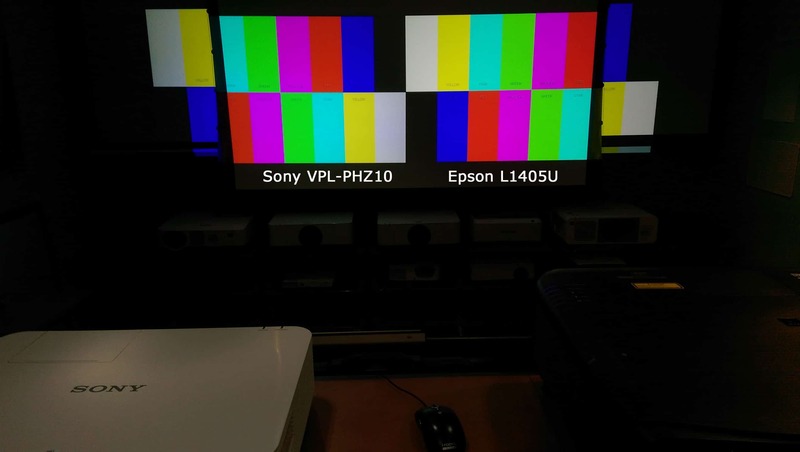 Here is the Sony VPL-PHZ10 on the left, and the Epson L1405U on the right – which has been turned down to match the brightness of the Sony to compare color. 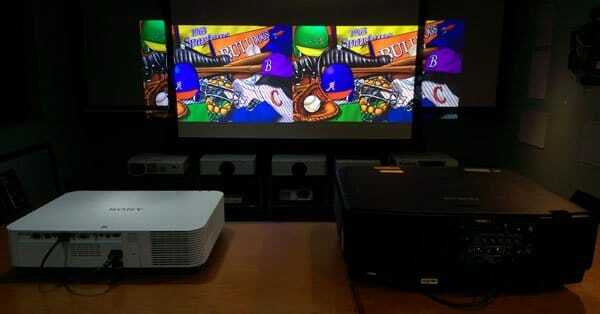 We were very curious to see how the new Sony compared to the new Epson Pro L series of projectors. This is really not an apple-to-apple comparison, as the Sony is 5,000 lumens and the Epson’s start at 6,000 lumens, but we still wanted to compare them. 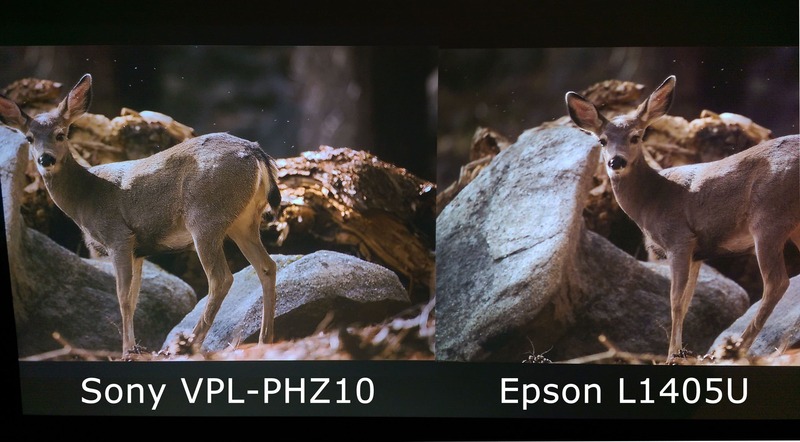 To do this, we turned the brightness down on the Epson L1405 to match the brightness of the Sony so that we could compare the color and image quality – not the brightness. Our Progressive HD screen was lowered to compare both projectors side by side – so we could do more critical evaluation. However, images fall off on either side onto two additional screens. Please keep in mind that these projectors are not real competitors – the Sony is 5,000 lumens and the Epson’s start at 6,000 and go all the way up to 12,000 lumens in the same chasis. This was more of a check to see how close the 3 chip color could perform. As you can see, in the first image above, the white balance or color temperature of white was very close – color was extremely close if you put the Epson L1405 in the SRGB color mode for HD sources. Skin tone, as shown on this Extron “Shootout” disc, is always a good way to compare projector images. The main difference above is a slight difference in factory preset white balance – which could have been adjusted to match even closer. Since most installs do not calibrate the projectors, we chose to use the manufacturer’s settings to make this comparison. This was one of the areas we were most interested in because the Epson L series was the first professional line of laser projectors to feature 4K Enhancement Technology. The 4K enhancement allows the projector to enhance and upscale the image to near 4K quality and accept true UHD (consumer 4K) signals. It has been tested and reviewed in many online comparisons and it has been found that the 4K Enhancement Technology is almost indistinguishable from native 4K at viewing distances. So, how does Sony’s Digital Reality Creation compare? Although the Sony does not accept native 4K signals (at least our prototype did not) the detail and image sharpness did give the 4K enhancement a real run for the money – as you can see in the close up below. So, at viewing distance both looked very good and detailed – and noticeably better than normal HD resolution. Saying one looked better than the other would be very subjective – especially since both have multiple adjustments for fine tuning within their respective menus. For this comparison, we used out-of-the-box or factory settings for the close up image below. Close up of very detailed images from the Extron Shootout Software. Although the color was slightly different on each projector, the detail on both were very impressive and exhibited very fine image sharpness. 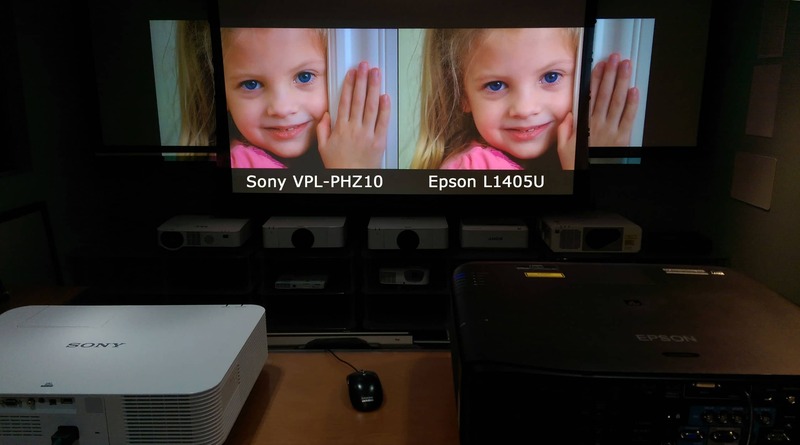 To our surprise, the image quality between the higher-end Sony projectors (VPL-FHZ60 and VPL-FHZ65) and this new “Laser Lite” was very close. Apparently the “Lite” has more to do with the physical lightness of the projector and the fact that it is not an interchangeable lens projector. We didn’t have a lot of time to do more tests, but I would not hesitate to use this new projector for those applications that need 5,000 lumens and require great image quality. Which Sony 5,000 lumen projector to use would depend more on throw distance, product availability, budget, and the need for interchangeable lenses rather than any difference in image quality. This entry was posted in AV Solutions and tagged 3 LCD, 4k enhancement technology, 4ke, brightness, business projector, classroom projector, color, color accuracy, detail, Epson, L1405, L1405u, laser projectors, projector, sharpness, skin tone, Sony, VPL-FHZ60, VPL-FHZ65.